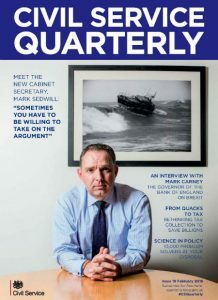 Civil Service Quarterly (CSQ) was the late Lord (Jeremy) Heywood’s idea, and he chaired the editorial board for its first five issues. His argument for a publication to showcase the best of Civil Service analysis and policy-making was simple: the Civil Service had much to be proud of and should not be reluctant to shout about it – but to be even better it needed to be open to new ideas, better at sharing innovations and open to challenge. CSQ was one way of achieving these objectives, and the first edition exemplified the developments that Jeremy championed. There were articles about the potential of digital to transform public services; data sharing to improve delivery; and using behavioural insights to crack problems where traditional policy-making had reached its limit. That edition also illustrated the extraordinary range of Civil Service work, from operational issues in HMRC, to the FCO’s role in the UN Arms Trade Treaty, and the Government Office for Science’s International Disaster Risk Reduction work. While CSQ’s focus was on policy and analysis, for Jeremy that did not mean concentrating only on Whitehall and policy-makers. The idea was to celebrate the work of all 400,000 civil servants, across all professions andin all their diversity, at home and abroad. Now in its 19th edition, CSQ continues to reflect Jeremy’s priorities for the development of a technologically and culturally progressive Civil Service focused on the best outcomes for citizens. With preparations for the 2019 Spending Review under way, Sir Michael Barber fills in the background to his independent report on the government’s management of public money. He looks at the report’s central proposals, in particular the creation of a framework against which to assess the effectiveness of spending in delivering outcomes. Following on from this, providing value for money is the subject of one of the questions we put to the Governor of the Bank of England, Mark Carney, in a featured interview. Crafting a trusted legislative and regulatory framework for processing and sharing personal data, to unlock its full potential and improve frontline services, is the focus of an article from two DCMS data policy specialists. The power of digital to make services more efficient and user-friendly lies behind HMRC’s innovative marketing campaign to encourage taxpayers to beat the deadline for online Self Assessment. Director of Communications Poli Stuart-Lacey charts how the move “from tax man to tax duck” increased compliance rates. As Dr Patrick Vallance, the Government’s Chief Scientific Adviser, reminds us, science and technology never stand still, and can play a vital role in effective decision-making. He challenges policy-makers not to forget the difference that scientists – there are 10,000 of them across government – and scientific evidence can make in solving policy problems of all kinds. In other articles, Latvia’s Ambassador to the UK assesses the practical and symbolic importance of free and open public institutions to her country, fresh from celebrating the centenary of its independence. At its best, the UK Civil Service is world class: intellectually rigorous, creative and fair; and dedicated to serving the public. But if we are to be truly world-leading we need to collaborate more, learn more from experts outside the Civil Service, listen more to the public and front-line staff, and respond to new challenges with innovation and boldness. All that remains true today. It is our intention that this and future editions of CSQ will continue to help the Civil Service strive to be world-leading in everything it does. Jeremy believed passionately that only a public service that could tap into the innovative talents of a truly representative and inclusive workforce would be capable of meeting the needs and aspirations of the whole nation. His commitment to realising that vision will find lasting expression in the foundation created in his name. The Heywood Foundation is a registered charity dedicated to supporting the causes that Jeremy believed in, particularly innovation in policy thinking and equality of opportunity for all. It has the full support of the Civil Service, which he led with such distinction and humanity. You can give us your views and comments on the Civil Service Quarterly blog, by email, or via #CSQuarterly on Twitter. If you would like to submit an idea for a feature in a future edition, please get in touch. We will publish each of the articles in the latest edition of Civil Service Quarterly (CSQ 18) as a blog post. If you would like to see the full publication, you can download it here as a PDF. It is a pleasure to read this appreciation of CSQ as of Lord (Jeremy) Heywood's idea, the focus points of CSQ and the following lines, which read as a tribute to the founder: "CSQ continues to reflect Jeremy's priorities for the development of a technologically and culturally progressive Civil Service focused on the best outcomes for citizens." Thank you.